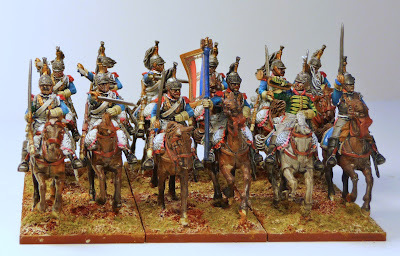 I had not planned to paint any French Heavy Cavalry as none of these units served in peninsula, aside from the 13ème Régiment de Cuirassiers and than they served in no major actions. 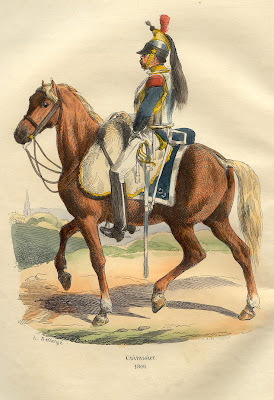 My new found interest in the Waterloo campaign has of course changed this. These are the first armoured cavalry I have painted. A brief run down on these units can be found here. 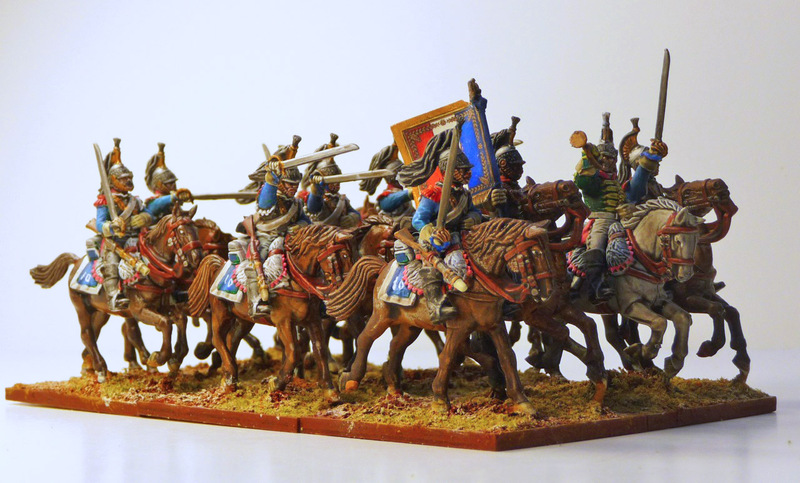 I decided to go with the Perry plastic heavy cavalry. These are nice figures, easy to assemble and paint and they look great. 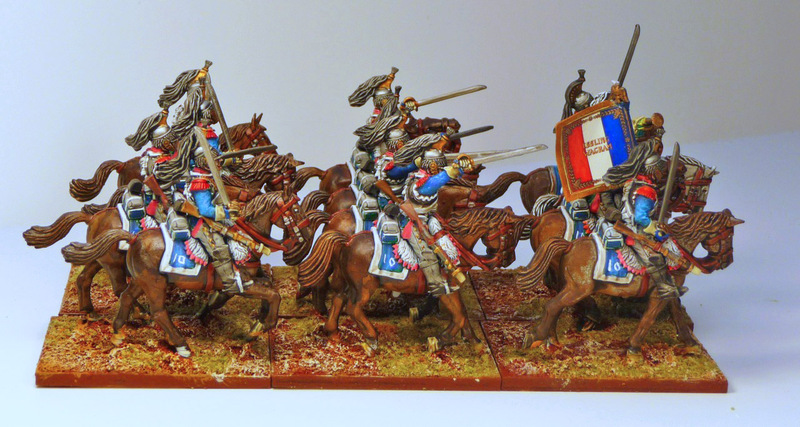 This is the second unit of Perry plastic cavalry I have painted, and I like these even more then the dragoons. As readers of this blog will know, these figures started off as green. A quick application of Vallejo Prussian blue followed a light drybrush of sky blue sorted that. The horses were done with Citadel Brown Ink. I am still trying to find a good pink, this is a mixture of red and white. If anyone has a suggestion for a premixed light pink, I would appreciate it, I do not like mixing colours. 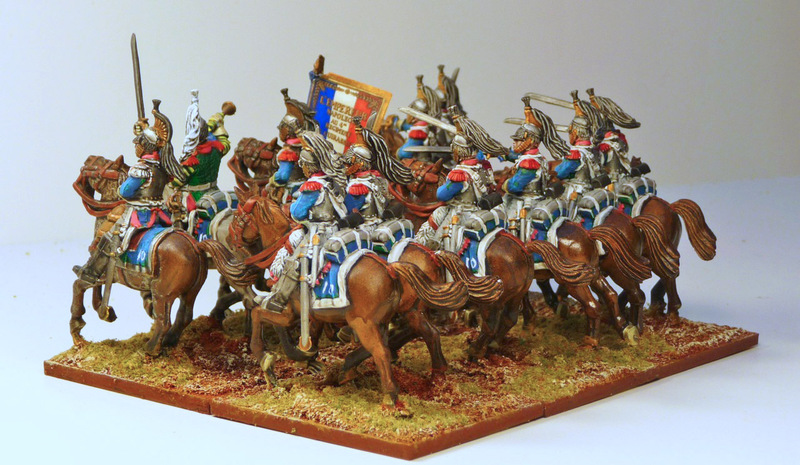 The unit is based as a large Lasalle unit with 6 bases, and I hope that they will see some action in my "La Haye Sainte" scenario. I have to say that I really enjoyed painting these figures. The knowledgable among you will of course point out that the 1ème et 4ème Régiments de Cuirassiers are in the OB for this action, but I wanted pink so we have 10ème. I have one more box of heavy cavalry which I believe I will do up as 2 regular Lasalle units (4 base); the 1ème Cuirassiers and 1ème Carabiniers. At least I did not have to repaint the trumpeter! I quite like this unit. More seriously, nice imperial livery on the trumpeter. Very nice 'save' John - they've turned out well. A nice dark blue ink wash will really make them stand out if you want to try it. This is one of the coolest napoleonic wargaming blogs !! !